You may be surprised to know that this deeply unflattering photograph is of me looking after my mental health! It was taken on a cold and wet day in November at Easedale Tarn in the Lake District. 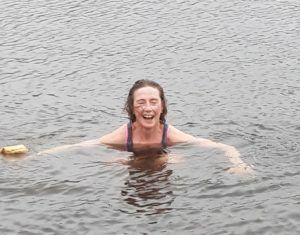 Steve might argue that it’s evidence that I have abandoned my mental health all together; but I simply love to swim in wild, freshwater locations (salty sea, not so much, though I’ll take it if it’s all that’s on offer!). There is something about the cold, untamed nature of these swims, something so ‘up close and personal’ with creation that makes me laugh out loud and makes my heart sing in joy and worship like very few other things can. In these moments when my senses are assaulted by the cold, the wet, the mud, the wildness, I am fully in the moment and feel fully alive. It’s good for me. I so often get locked into my head and forget I have a body; that’s impossible when you’re swimming in water that’s 10 degrees. It’s good for my mental and spiritual health to do this, whenever I can find time in a busy life. I wonder what looking after your mental health looks like for you? When we take time to nurture our bodies and our souls, we acknowledge that we are not God, we have limits, we have needs, we are human. And God loves our humanity. Christmas is a wonderful time to remember that God loves our humanity so much that the came in human form as Emmanuel. Jesus, fully God, fully man. It’s also a time where our mental health can come under pressure; perhaps through busyness, perhaps through financial strains or difficult family situations, or a whole host of other things. When mental health affects so many areas, we ignore it at our peril. Perhaps you’re not sure what helps or hinders your mental health, perhaps you’ve never thought about it before, perhaps you feel your mental health is very good, perhaps you’re wobbling with it at the moment? Wherever you are, take a moment to receive that your mental health matters to God. Here is a link to an excellent website which can help you understand and support people around you (maybe in your Missional communities, or at work or home?) who may be struggling with their mental health, and also may help you, if that describes you. Whatever you take from these brief thoughts, may I encourage you, as we rush into the crazy Christmas season, to think of one thing you will do to bring a smile to your face over the holidays? It may not be as radical as plunging into an icy lake, it may be as simple as carving out some protected time to enjoy a cuppa in peace, or taking a few moments to enjoy the lights on the Christmas trees. Give yourself something to look forward to, it’s a real mental health boost. Emmanuel, God with us in everything.